The Flying Pig Marathon is committed to research and implementation of policies and procedures to be a more sustainable event. As a certified green event, we adhere to principles in five sustainability categories set forth by the Council for Responsible Sport: Planning and Communication, Procurement, Resource Management, Access and Equity, and Community Legacy. Communicate the Flying Pig Marathon’s efforts to produce a more sustainable event that the city of Cincinnati and surrounding communities can be proud of. Take the bus to the P&G Health & Fitness Expo. There are 21 routes that stop near the Duke Energy Convention Center and 28 bus routes that come to Government Square, just three blocks from the Expo. The Cincinnati Bell Connector also stops three blocks from the convention center. You can plan your route using Google Transit or download the EZRide Just put in your home address and the address of the Duke Energy Convention Center (525 Elm Street) and get a list of buses and times to use. Thanks to the management of Longworth Hall, free parking is available to those who carpool on Saturday and Sunday morning. Longworth Hall is .5 mile from the start line. Saturday the lot will open at 6:00 am. Please note that due to the 10K race, the entrance to the lot will not be available 7:30 am – 8:30 am. Sundaythe lot opens at 5:00 am. Parking in this lot is permit only. You can pick up your permit at the P&G Health and Fitness Expo. Look for the Carpool Parking booth in the Green Zone of the expo. In the finish line Recovery Area and Post Race Party at Smale Riverfront Park, look for the Recycling Stations staffed by Green Team volunteers. The Green Team volunteers will assist you with the proper container for your waste. Sustainability, as the word suggests is the ability to sustain. In order to create a more sustainable living environment and protect the future of humankind, we must treat the earth as our garden and make sure we are giving back as much as we are taking. Since 2009 the Flying Pig Marathon has been taking steps to be a more sustainable event by practicing the three R’s of waste management: Reduce, Reuse and Recycle. We have reduced the amount of paper used by no longer printing promotional brochures, results books and finisher certificates, which are all now done electronically. Also, with the introduction of the Virtual Goodie Bag in 2011, over 2 million pieces of paper have been eliminated from the waste stream. The marathon collects discarded clothing at the start, and donates them to charities in the area. Any leftover food from the recovery area is donated to local food pantries. Banners and signage from the event are stored and reused the next year. Outdated banners and signage are donated to Matthew 25: Ministries and Crayons to Computers to be repurposed in their various projects. Ribbons from leftover participant medals are used as lanyards race weekend. Since 2009, our recycling has expanded beyond water bottles to include paper, plastic, discarded participant Heatsheets, chip bags and excess medals. 57.9% of all waste was diverted from the landfill. Items recycled or donated increased 28% over 2017 with 14.9 tons being diverted. 1,900 pounds of compost was collected, which was a 28% increase over 2017. 2,025 pounds of clothing collected at the start of the race were donated to Goodwill, a 13% increase over last year. 5,960 pounds of leftover food were donated to local food pantries. 13 pounds of leftover medal ribbons were repurposed as lanyards race weekend. 524 pounds of Heatsheets, shrink wrap and other plastic were recycled through Meijer. Other items recycled were: 5.3 pounds of chip bags, 5 pounds of Capri Sun pouches, and 100 pounds of GU packets recycled through TerraCycle, 30.5 pounds of #5 plastic recycled through Preserve’s Gimme 5 Program, and 10.5 pounds of extra participant bibs were recycled at CFS Recycle. With the addition of Saturday Carpool Parking, 1,205 cars used the free carpool parking, transporting 3,536 passengers. Saturday sold out and Sunday saw an increase of 37% cars and 33% passengers. The P&G Health and Fitness Expo featured a ‘Green Zone’ where sustainability efforts were promoted in collaboration with four community partner groups. The area offered sign-ups for carpool parking and featured the Flying Pig sustainability efforts. In 2018 we focused on reducing food waste. Over 1,300 participants donated $1 to offset their CO2 emissions from traveling to Cincinnati for the marathon weekend. The Flying Pig matched their donation and was able to purchase credits to offset their travel 100% plus offset 26% of all long-distance travel by participants. In 2011 The Flying Pig received the Excellence in Public Recycling award from the Hamilton County Recycling and Solid Waste District, and certified as a green event by the Council for Responsible Sport. In 2013 and 2014 The Flying Pig was a finalist in the Green Business Award for Green Practices, sponsored by The Business Courier and recertified by the Council for Responsible Sport at the Silver Level. In 2015 The Flying Pig was the winner of the Green Business Award for Green Practices. In 2015 The Flying Pig was certified by the Council for Responsible Sport as a green event at the Gold Level. 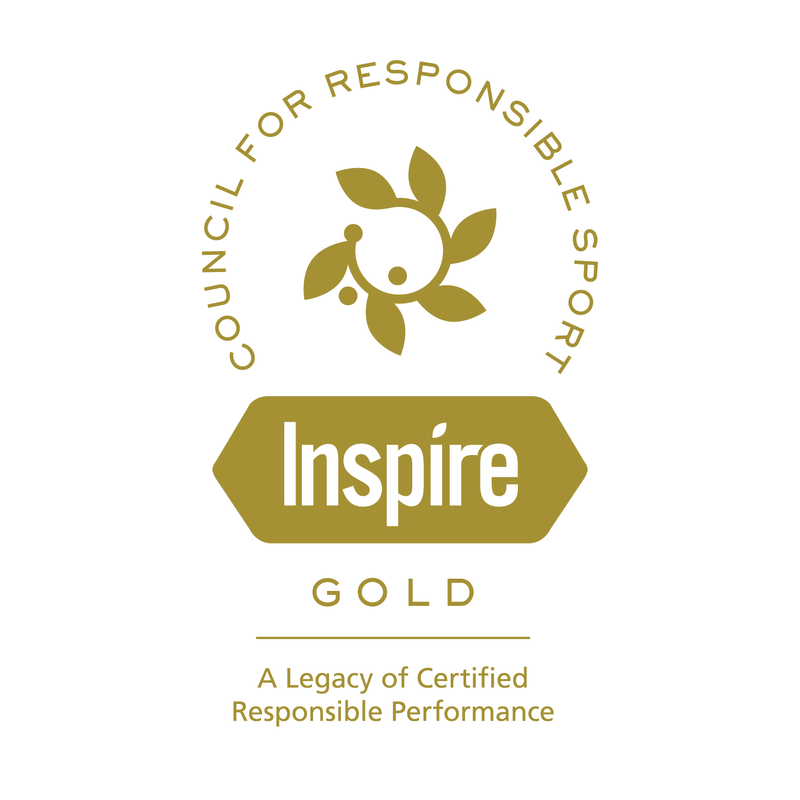 In 2017 The Flying Pig earned Gold Level Inspire Certification from the Council for Responsible Sport. Inspire event status is awarded by invitation to events achieving multiple certifications from the Council, to recognize the legacy of their commitment to sustainability and thoughtful resource management. The Flying Pig Marathon Board Members and Green Committee are working hard to find more solutions to become a fully sustainable event. Look for more sustainable projects on this website, Facebook, Twitter, and our email newsletter, The Squeal. The Council for Responsible Sport (CRS) is about inspired innovation and unprecedented collaboration. As a Council, they were developed to provide a valuable roadmap and the resources necessary for event organizers to incorporate tenets of social and environmental responsibility into their organizations. The mission of CRS is to partner with and empower sport as catalysts for sustainable change. We provide the opportunity for sports events to pursue and receive certification, leaders to participate in peer-to-peer learning communities, access to online tools, case studies and strategic partners to assist the myriad stakeholders within the sports industry in their efforts to go green. Founded in 2007 by the directors of The Freshwater Trust Portland Triathlon, the Council for Responsible Sport was created as a response to a growing need for planning models that take into consideration the social and environmental impacts of sports events.